Throughout its history, humanity has developed a variety of cultural techniques that have made it easier for people to live together. Solutions to complex problems have been found through creative responses to different situations. The origin of all these problems are are the basic human needs. For example, the cultural technique of making fire can be traced back to the need for warmth, protection and light. It requires knowledge of fuels and other physical properties. The cultural technique of celebration, which is located in the social area, arises from the need for pleasant social contacts. This requires knowledge of dress codes, rituals and symbols. However, you must not forget the consequences in the form of nausea and headaches in this discipline! Why do I tell all this? On the one hand, because I am a sociologist and therefore, I get off the track sometimes, on the other hand, because Gùgong by Andreas Steding deals with a cultural technique in the economic field, which has been in the repertoire of mankind over the last centuries in the most different forms. It is corruption that plays an important role in human coexistence to this day. Driven by greed and the longing to outperform others, interesting ways have been developed to reach various advantages, despite the attempt to ban corruption and to suppress it and despite all prohibitions. In 1570, the Forbidden City Gùgong was ruled by Emperor Longqing. He tried to eradicate corruption and bribery in his Ming Dynasty empire. But although the death penalty was written on the use of it, the citizens and officialsa faund a way to circumvente the ban on corruption: the exchange of gifts! 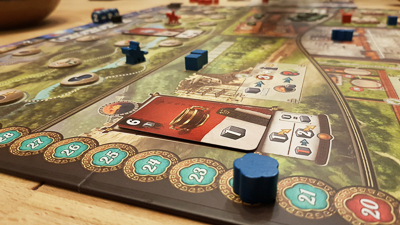 In Gùgong, the players assume the role of powerful Chinese families who try to gain influence and power by bribing the responsible officials. Of course the bribery mustn't become public. On the contrary, the players try to give the officials a financial advantage through a skilful exchange of gifts. It is important to note that as a civil servant it is not only an honour to receive a gift, but also to donate one to the applicant. As long as the gift that the official receives from the claimant is more valuable than the gift that the claimant receives from the official, everything runs smoothly. As a player in Gùgong you don't need much to start the game. Each player receives a set of four gifts of different worth, represented by cards with different values. After all, you need something that you can give to the officials. As a representative of a rich family you also get twelve servants, obviously you can't do everything on your own. At the beginning of the game, however, only six of these servants are available. The rest will remain in a personal supply from which you can get new servants during the game. 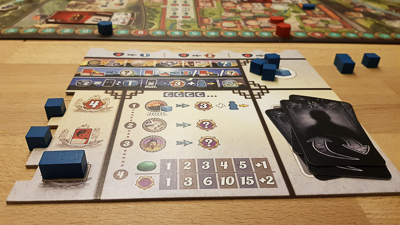 Players will also receive a player board, a traveller, three grand canal ships, an intrigue marker, a victory point disc and a foreman who counts as a double servant. These items will be used throughout the game in the various areas of the Forbidden City. A key representative of the family is the envoy. He is used at the palace of heavenly purity. Only if he receives an audience with the emperor a player can win the game. If, however. the envoy is not let in, all victory points of a player will be worthless. So excellently equipped it can already start. In the forbidden city there are 7 different areas in which you can exchange gifts with the officials to get victory points or expand your influence. The game consists of three phases. In the morning phase mainly preparation and resource filling actions are performed. In the following day phase, the players carry out the barter transactions, and in the night phase various bonus actions are made. The most important mechanism of the game takes place in the day phase. Players can exchange one of their gift cards from their hand for a gift card from an official in the seven different areas of the Forbidden City. Additionally they can perform the corresponding action(s). Of course, the value of the gifts has to be considered when choosing a location. It is only a good exchange, if the gift of the applicant is more valuable than the gift of the official. In this case one may accomplish both the action illustrated on the gift card, and the local action. If the gift given is worth less or the same as the gift on the board, the bribe will be less successful. A player must either put back two of his servants in his personal stock or put a second gift card on his discard pile in order to be allowed to perform such an action. If that's not possible, there is always a chance ton exchange cards, but in that case it is not allowed to perform any actions. As you can see, a misplanning of the gift distribution considerably restricts the action possibilities. The planning and foresight of an opponent can of course also contribute to this restriction. As with any good rule, there is of course an exception. The gift cards with the value 1 can be exchanged free of charge with cards with the value 9. Finally the fruit bowl with has a value of 1 is very tempting for a healthy eating official! How bribery works has now been clarified. But what is the point of it all? The aim of the game is to collect the most victory points. Sometimes this can be done directly by getting the possibility to travel to cities on behalf of the emperor to collect taxes, in which case you immediately get a travel token with victory points. In another area you can exchange your gifts with jade, that will give you victory points at the end of the game. In many areas of the forbidden city, however, you must use some of your servants to perform the corresponding action. Most of the time, these servants will be returned immediately to their stock. Some actions, however, leave them on the board for a long time or even permanently. The use of the servants, however, always brings short-term and permanent advantages. For example, you can leave a servant permanently at the Decree Official to receive certain benefits in a morning or night phase of the game. If you use a servant in a port, you can, take an additional gift card in your hand and have one more action. Gùgong is a simple and complex game at the same time. The intersting game mechanism of exchanging gifts is easy to understand and easy to use. It meets a playing area that offers a wide variety of ways to use the gifts and use the resulting actions. The game becomes complex not only due to the sheer amount of possibilities, but also because of the daily structure of the game. This makes it possible to react with tactical variants to the actions of the opponents by planning activities across the day. When I read the excellent rule book for the first time, I initially thought that I wouldn't remember all the rules. 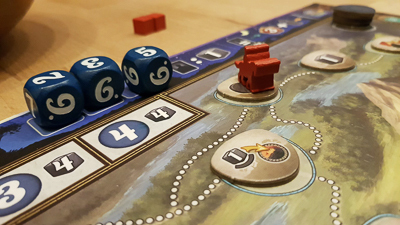 When I then took a closer look at the game board and set-up Gùgong for the first time, I noticed that the implementation of the rules is easy to understand. The various playtesting sessions have also shown that the game is easy to explain and quick to learn. 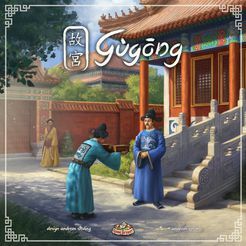 Funnily enough, it wasn't quite clear to me at the beginning whether Gùgong is just a card game that unnecessarily received a game board as a gift. In retrospect, however, I have to say that the game is a board game to its core. Enough bribery for today, I think I'm devoting myself again to the cultural technique of celebrating for just one evening.